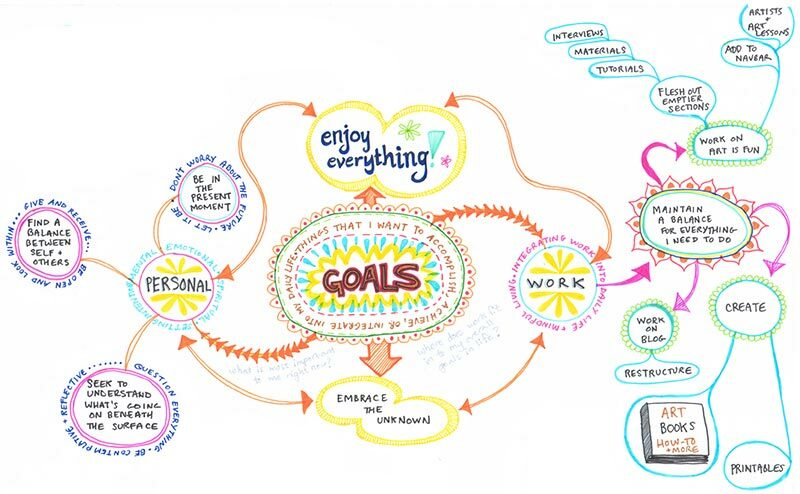 Learn how to create a mind map, like the squiggly colorful image below! Wow, can creating a mind map really do all of that? Yes, if you fully participate in the process! Basically, a map is a visual representation of a place, specifying noteworthy elements. A mind map therefore depicts the contents of your mind. Cool, huh? 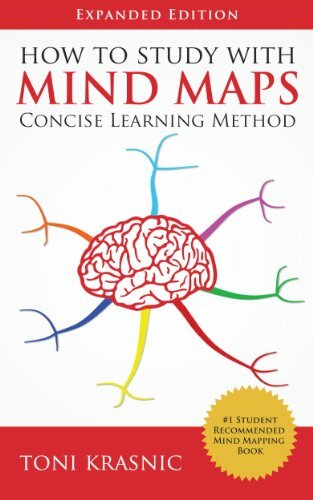 What are some mind map uses? You can create a mind map about any number of topics. The possibilities are really limitless! 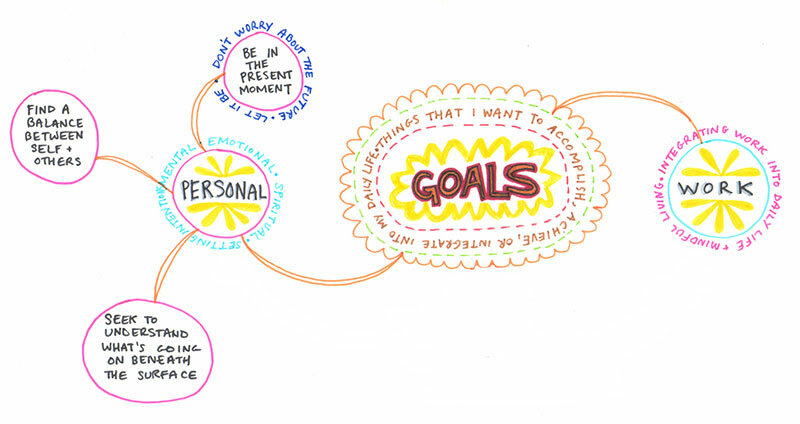 One of most popular mind map uses is to create a mind map about your goals. This allows you to articulate your goals, put them down on paper, and see how they are interconnected. 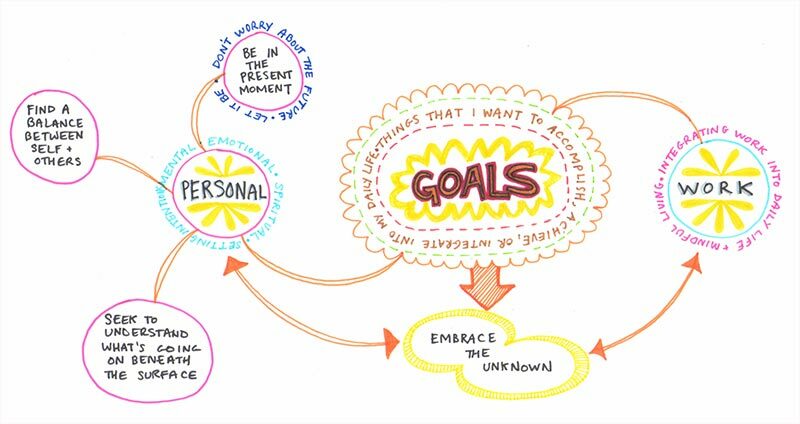 You can mind map about immediate goals (such as daily tasks or an elaborate to-do list) or mind map about long-term goals that extend far into the future. 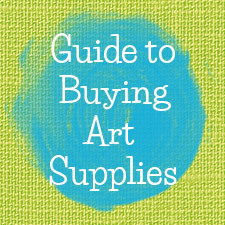 When you're done, you will have a beautiful mind map that you can hang on your wall in your studio or in your workplace, tape inside your sketchbook, or place anywhere that will allow you to see it every day. By visualizing your goals, you can help center your energy and focus your intentions on what you want to do or achieve. What are mind maps supposed to look like? Your mind map can look like anything you want it to! Let's take this idea of "supposed to" and throw it out the window, shall we?! 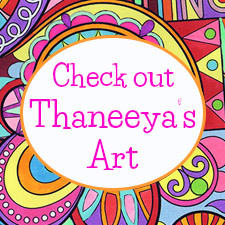 Creating a mind map is easy and fun, whether you are artistically inclined or not. Think of it as an extended doodle, if you want. A daydream in full-blown color. Whatever you create rocks with the essence of YOU. Mind maps use words, colors and images to convey meaning. 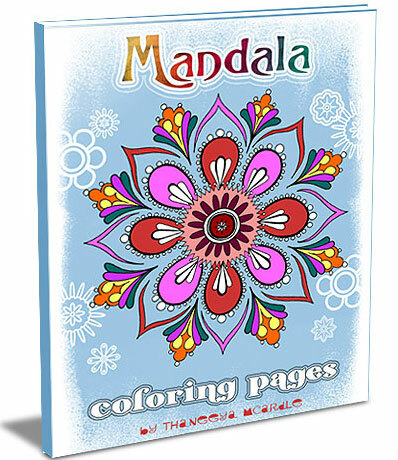 Typically, mind maps start in the center with the main theme and emanate outwards. Thoughts and ideas branch outwards from the central point. But they don't have to be that way, of course. Mind maps are a way of organizing your thoughts. However, artists are dreamers, often disorganized by nature, attracted to calamity and chaos more than straight lines and perfect edges. Therefore, let your inner light shine when you create a mind map. Let your mind map express your innermost essence. Often, mind maps are readable and understandable only to the person who created it. And that's totally fine! Now that you understand the basics, learn how to create a mind map! These instructions show you all the steps I used to create a mind map. As mentioned earlier, there are a lot of different ways to create a mind map, and you can even come up with your own ways that suit your needs and whims of the moment. Checking out the step-by-step progress of how I created this mind map should help you understand the building process - which will help you create your own mind maps! When you create a mind map, you can simply start from scratch or you can brainstorm beforehand, writing down a list of things you want to include in your mind map. Either way is okay! I decided to create a mind map about my goals. My hope is that this mind map will help me sort out all the various goals (and things to do) that constantly rumble through my mind. By putting it all down on paper in a flowing visual form, I hope to reconnect with my motivations each time I look at my mind map. Starting in the center, I wrote the word GOALS and surrounded it with a spiky yellow cloud form. I decorated my main point a bit more and further clarified my intention by writing a phrase encircling the word GOALS. I wrote: Things I want to accomplish, achieve or integrate into my daily life. When you are creating a mind map, you are allowing yourself the time and freedom to really think deeply about whatever the subject matter of your mind map is. So take your time and don't rush the process. I divided up my goals into two main sections: personal and work. Both my personal life and my work life are important aspects of my being, and I always feel better when they are well-balanced. I wrote some clarifying words around each circle, and then connected them to the main circle. Connecting lines are important in mind maps, because they show relationships between ideas. Connecting lines depict the flow from one idea to the next. Time to get more detailed and specific about my personal goals. I wrote down two of my specific personal goals and drew circles around them. I then connected these two specific personal goals to the main circle for my personal goals. 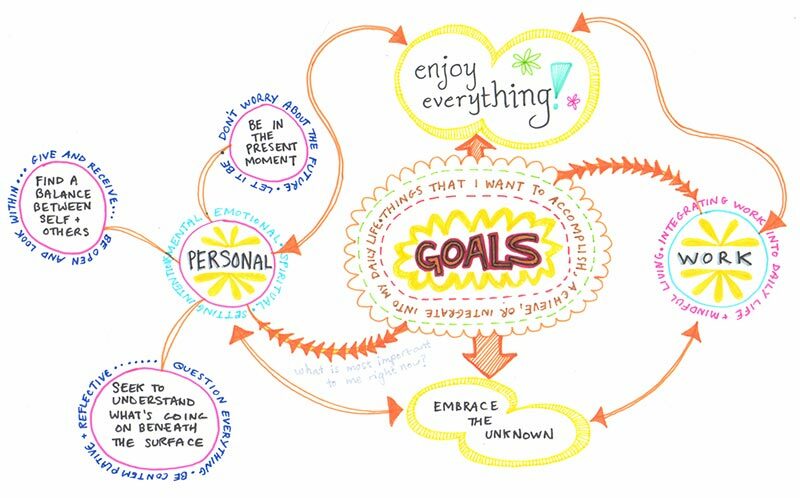 As you can see, the mind map begins to flow from my main goals to my personal goals, getting more specific as the circles flow outward. Continuing in this vein, I added another specific personal goal and wrote some more words about that goal around the outside of the circle. Now that I'm writing down my specific personal goals, I'm really starting to get introspective and philosophical, pondering the meaning of life and nature of reality. I decided that even though I am setting goals, I need to remember to embrace the unknown in all aspects of life, both personal and work-related. I write this goal beneath the main central point. 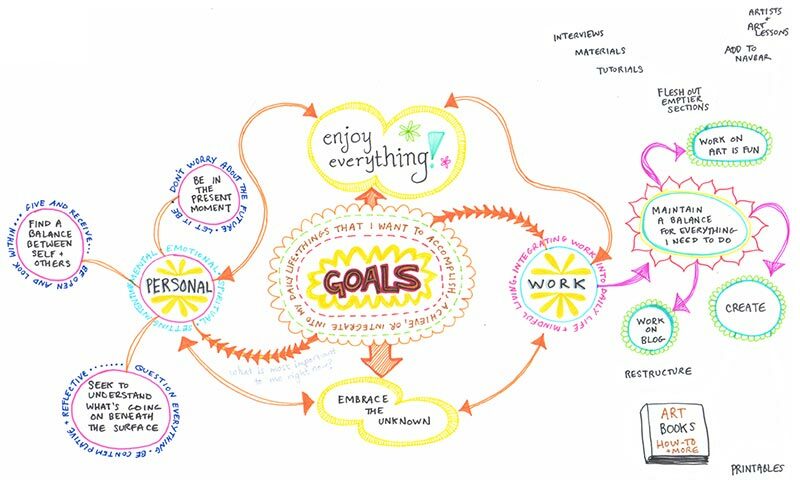 Because it's so important, I connect to it from both the circles for personal and work, and also give it a special direct link right from the main central circle for my goals. Upon reflection, I realize that I'm getting really deep here. "Deep" can sometimes become "heavy", so I decided that I need to remember to lighten things up when things do get heavy! I wrote enjoy everything! in nice, happy letters and put in a couple flowers. Because this goal is so important, it also gets connected to the main goal as well as the hub for my personal and work goals. I made swirly, whimsical connecting lines from personal and work to this new goal, to reflect the easygoing, meandering nature of enjoyment. Okay, now it's time to start thinking about my work goals. Because I have so many work-related goals (which I jotted down earlier), I realized quickly that my work goals needed to flow around a central hub that reminded me to maintain a balance for everything I need to do. To make this goal stand out more, I decorated it with spiky red flower petals. I then wrote down 3 of my main work-related goals. I decorated the circles with rounded light green flower petals. My work goals are rather specific, so for each work goal I wrote several sub-goals. Just like a to-do list... only way prettier and more fun to write! I connected the "to-do list" with each of the goals that they relate to, branching into more and more specifics. 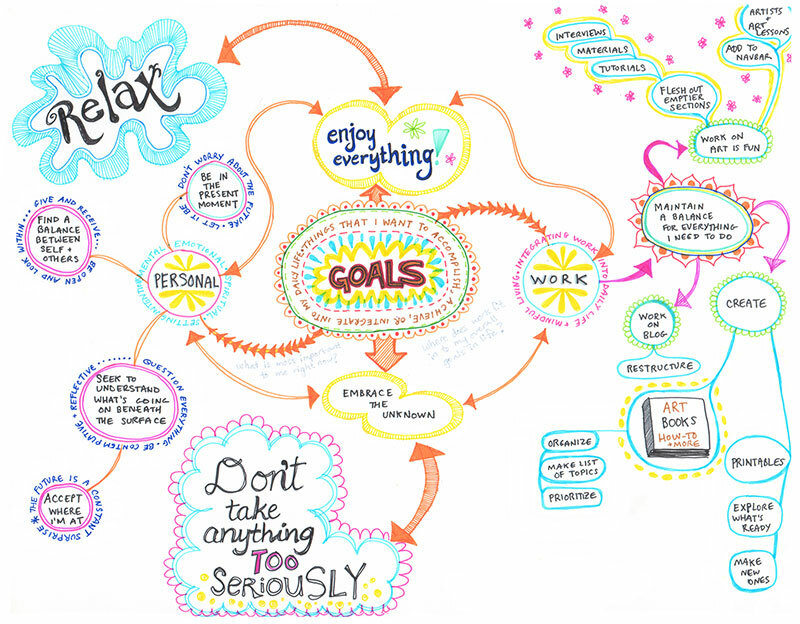 After writing down my specific work goals, I decided that in order to see the big picture, I need to remember to relax. 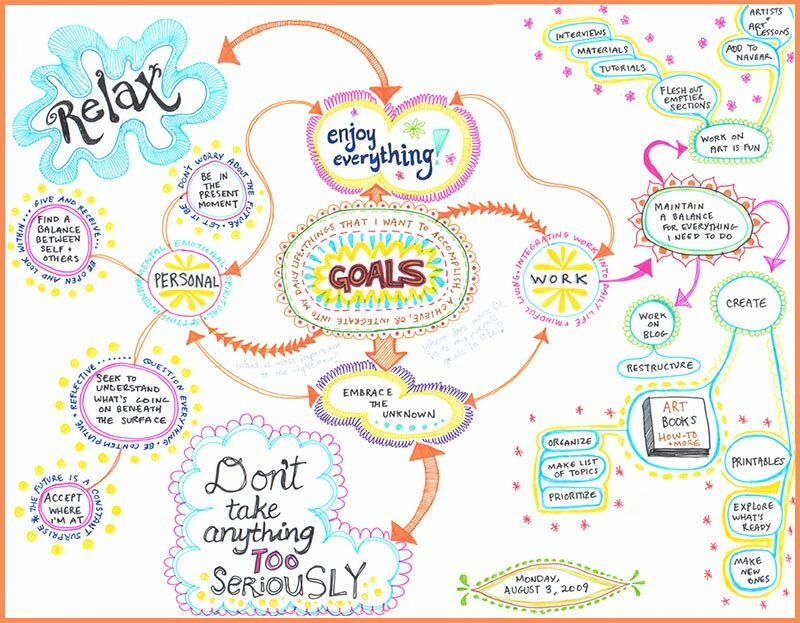 I wrote relax in big fancy letters in the upper left, and connected it to enjoy everything with a big orange arrow that flows in both directions. On a similar note, I wrote Don't take anything too seriously at the bottom and connected this to Embrace the unknown. These last two goals are important and help unify the intention that I set out for my life, both personal and work-related. Because they are bigger and have nice blue decorations, my eyes are drawn to these two goals every time I look at my mind map. This helps me see the big picture, rather than get too caught up in all the tiny details of life. Now that I've written down all my goals, I go back and add colorful decorations here and there. This makes my mind map more fun and pleasant to look at. I also add the date to the mind map. Adding the date is a good idea when you create a mind map, so that when you look back on it, you can see how well you've been able to stick to your goals. Also, if you come across your mind map years in the future, it will be interesting to see what was on your mind back when you made it! If you want to see the detail in this mind map, click on the image to view a larger version. Now that you know how to create a mind map, go and create your own! Enjoy the process and see where it takes you! There's so much you can do with mind maps. 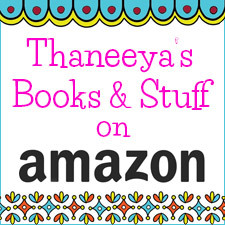 Here's some helpful books you might be interested in. 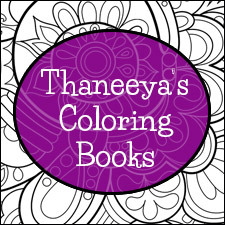 If you purchase one of my recommended products I receive a small commission that helps support this site. Thanks in advance!